ONE of the very best takeaway dishes in Britain can be found in Knaphill, according to a national competition. The seafood pasta at Lorenzo Deli on High Street earned Lorenzo Montuori a place as a finalist in the Best Takeaway Chef in Britain category in the British Takeaway Awards. Lorenzo didn’t get first place in the BTAs, which are run in association with Just Eat, but was delighted to have appeared at the awards ceremony at The Savoy in London last week. “I would like to say thank you to my customers for nominating me,” he said. 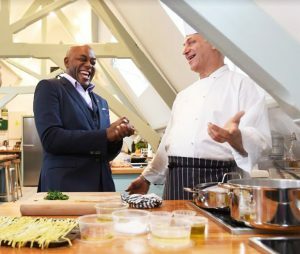 As a finalist, Lorenzo had been invited to to Cactus Kitchens in London, home of the BBC1 show Saturday Kitchen and Michel Roux Jr’s cookery school, to cook his seafood pasta for the competition judges, including celebrity chef Ainsley Harriott and businesswoman and Dragon’s Den star Sarah Willingham. The dish of shellfish and squid includes parsley, basil, chilli and lemon zest.